Offering spectacular scenery in the Abisko National Park deep inside the Arctic Circle, the Swedish Alpine Ultra (SAU) shuns large crowds and traffic jams, corporate sponsorship and commercial interests, and excessive nannying of its runners. Instead, those who are fortunate enough to get to the start are offered a low-key ultra which is all about getting back to basics with a focus on self-sufficiency in the wilderness. Although fell cabins are spread out every ten miles or so along the course, there are no roads. Thus, if you hurt yourself, the only way to DNF is by helicopter rescue or crawling to the finish line or back the way you came. This isn’t one of those ultras where you earn a belt buckle by doing a couple of flat loops of paved road with cheerleaders shoving bananas in your face every hour. 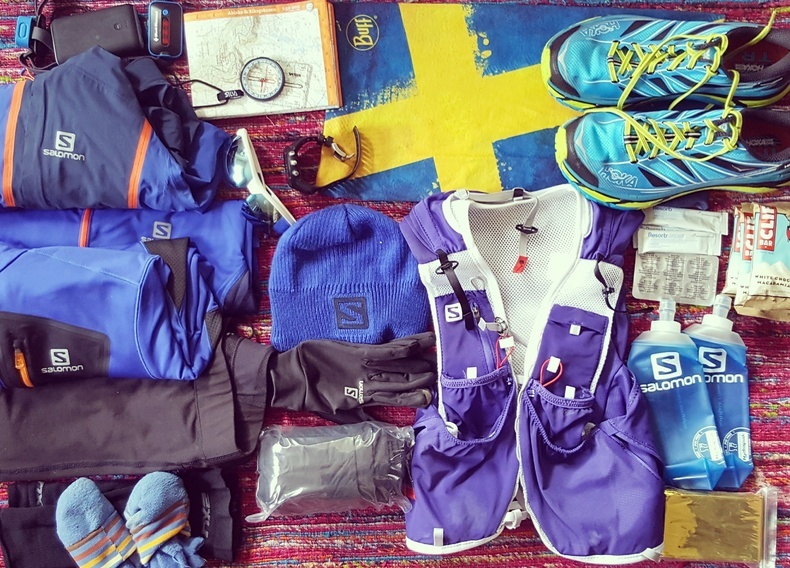 The man behind SAU, Roland Engström, deserves respect for keeping it the way it is and, if you ask him nicely, he’ll even tell you what provoked him to set up this gig. SAU is a project of love. There is no profit in this event. But there’s also much beyond the actual race to the finish line. Great lodging and food is offered at both ends. The start is in Nikkaluokta, home to Sámi settlements for thousands of years, and the finish in Abisko is world-famous as a spot to see the winter Northern Lights and one of Sweden’s most cherished fell stations. And there’s a very special feeling of comradeship between those who take part. Nobody is better or worse than anyone else and, along with rookies like me, the event seems to attract repeat offenders. Everyone is genuinely lovely and the nights before and after the race give ample opportunity to chat and get to know the crowd a bit. I started training for this roughly half a year before and had run about 1,000km during that period. Although I’d done a fair bit of hill work in places like the Peak District and Black Forest, my longest run had only been a 50km out and back trail in relatively flat Uppsala so I wasn’t entirely sure how I would cope with more than double the distance as well as mountains. Judith, a fellow trail runner from Uppsala, had joined me on quite a few of my longer runs and, as she had managed to bag a place at the last minute, we decided to run the whole race together. Our strategy was conservative: take time to eat and drink properly and, above all, start walking the ups and tricky bits before we thought we needed to. Actually travelling to the start in Nikkaluokta is an adventure in itself which is often overlooked or otherwise taken for granted by Swedes. Sure, you can fly to Stockholm and connect onto a domestic flight to the nearby town of Kiruna. But the only proper way to get there is by taking the sleeper train. In this sense I feel privileged as I only needed to cycle ten minutes from my home to the station. (It’s worth noting that if you time your flight into Stockholm Arlanda right, you can stroll to the airport station after landing and catch the same direct train.) After dumping my bag on my berth, I got cozy in the bistro wagon and carbo-loaded on overpriced Norrlands Guld. I always seem to have issues sleeping soundly on trains but these berths were actually comfortable. Take the train if you can and certainly before some bureaucrat decides to take it away against all common sense: sleeper trains are an endangered species. On arrival in Kiruna the next day, a bus was waiting to drive us the hour or so to Nikkaluokta. We were too early to check in to our cabins but I found someone else’s bed to snooze and drool onto in the hours before a pre-race briefing (which dramatically took place in a church) and a dinner of moose and potatoes. And then we all went to bed. No crappy distorted music with awful aerobics session to pump us up, no air horn, no starting gun, not even a whistle. Just Roland with half a dozen stopwatches around his neck counting down “three, two, one, go” in such a faint voice that I wasn’t even sure if we had started or not. About ten minutes into the race my feet got drenched and stayed wet for the rest of the course. I accepted early on that people weren’t joking when they said that we should expect a lot of water. Lots of time spent wading across swollen rivers later on. And much of the decking which is there to keep you above flooded areas was itself submerged due to snow melting late in the season and excessive rainfall over the previous days. Don’t bother with Gore-Tex. It’ll just keep the water in your shoes. Instead, try to have shoes that are good at squishing out excess water. And just accept that your feet will be wet for a long time. Luckily the water is so icy cold that you won’t have any sensation in your feet. Fantastic! Being brazen enough to attempt running across these fields strikes me as particularly mad. Stage 2 taught me that it was arrogant to assume that the entirety of the course could be “runnable” and that time and speed predictions are a fool’s game. I suppose I could have attempted to run across this minefield of wet, slippery, round, football-sized rocks, but I have kids to take care of. It was my first crack at this sort of thing so I chose to play it safe. …although this was also where I stopped by a cabin only to happen upon Andreas, a fellow runner who had fallen over, dislocated his shoulder which had popped back in, then fallen over again, dislocated his shoulder again, and was now in such horrible pain that a helicopter was on its way to him. I was there long enough to see the helicopter land and the doctor and pilot nonchalantly chat with those kindly people who man these cabins whilst violently shoving his shoulder. A running joke for 2017 is that Andreas actually won the race, just not entirely by foot: after a casevac to a regional hospital in Gällivare, he then got a taxi for the 220km journey to Abisko. I hope I haven’t misrepresented this story but, in any case, this stage introduced me to the perils of falling over. I was to fall over many more times before the race was done. The more tired I got, the lazier my brain became, the less I lifted my feet off the ground, and the more it felt like my feet were a sort of black hole magnetically sucking all manner of roots, rocks and debris towards them. Stage 4 taught me that snow is bad. There was so much horrible, slippery and unrunnable snow. It sapped so much energy and was just completely pointless. I hated it. I hated the horrible scramble on all fours up to the summit of the Tjäktja pass. It was rubbish. Stopping at the wind shelter at the top, I swallowed my first painkiller. I was cold and miserable. I couldn’t feel my fingers as my gloves were too thin. I wasn’t anticipating having to become an overclocked goat and use my hands as extra feet in order to summit a mountain pass. But at least it was downhill, although not in the sort of “Woohoo! I’m flying down this hill and I’m amazing!” kind of way. More of a “I’m such a moron and can’t feel my balls” kind of way. But it was true that I could see the cabins from a long way away. And it felt that they never actually got any closer. They were a long way away for a long time. I felt sorry for myself at this point. Stage 5 was my Kurt Cobain moment, so to speak, and I entered some sort of depression. But I was eating well, drinking plenty of water and still managing my body and expectations well. Although I still couldn’t feel my balls, I wasn’t too concerned since I already have two kids and don’t need any more. All I really remember from this bit was the Alesjaure cabin where I drank some sort of broth consisting of half a stock cube in water, ate lots of sour cream crisps (or chips if you’re linguistically deranged), and running for a long time by the side of a lake. I was starting to get a bit fed up with the fact that I was still running. I was actually doing a lot more running than I had anticipated. I was walking the hard bits but had established a new rule that I was under no circumstances to walk on decking or the rare smooth patches. And then I invented an irritating mantra: “The more you run, the sooner it’s over…” It was stupid in its obviousness but I repeated it loudly for a couple of hours and it seemed to help somehow. I think this was the part where I started seeing things, mistaking bushes for backpacks. But there was simultaneously a growing awareness that I was actually getting closer to the finish. Stage 6 saw my earlier depression lifted by a sense of optimism. It dawned on me that, provided I continued to play the game conservatively, to not smash myself up tripping over a rock in my confused state, I would get this done. The last couple of hours felt like a lifetime but they were strangely not the hardest. I felt remarkably good physically and mentally, I was still managing to run in a respectable fashion, I was doing alright. The last bit felt like a glorious motorway compared to the hundred of so kilometres behind me. Hardly anything for me to trip over! This was were our conservative strategy really paid dividends. Sure, I was getting fatigued and starting to mildly hallucinate, but I wasn’t really suffering. This final stage involved just ticking over and putting one foot in front of the other. And eventually I stepped over the finish line at around 3am, collapsed into a chair and started to cry. I had spent part of the earlier stage taking to a lovely couple called Tua and Ingemar and now found them warming up in the sauna. With no respect for decorum, Tua borrowed my cherished Swiss Army knife to perform surgery on her feet in the sauna. * I had sleep issues for a couple of nights after the race, was extremely stiff and sore but mentally felt like I was on a huge high for a long time afterwards. My feet were not far off becoming macerated by the constant submersion but they were miraculously blister-free. This I suspect was due to the combination of shoes and socks: Hoka One One Mafate Speed 2 and Injinji. My only gripe with the Hokas is that they could do with a bit more reinforcement at the front: it’s not nice playing football with rocks. I also wish that I’d packed thicker gloves. I hadn’t anticipated having to use my hands to scramble up the snowy Tjäktja pass and felt myself cold and exposed at its summit. Navigation is relatively straightforward and a map and compass is sufficient (provided, of course, that you know what you’re doing with them). But it was good having the route uploaded as a GPX file onto my Suunto Ambit 3 and being able to glance at my wrist if I was at a junction and not completely sure of what path to take. I had a battery pack and cable for both watch and mobile phone which served as a camera (bear in mind that there is no mobile coverage for 99% of the course). I never needed my headlamp as the sun never really set. It was good having sunglasses to avoid the glare of running on the snowy parts. As for nutrition, I knew that I wanted “proper food” and tried to steer clear of gels and the like. (I’ve always preferred salt over sugar anyway.) And it turned out that this was a smart move as I didn’t suffer from the nausea or stomach upsets I’m normally plagued with during marathons. I actually enjoyed chewing my way through a kilo or two of Swedish meatballs and pytt i panna even if it weighed me down to start with. As for hydration, a great beauty of this race is that the water throughout the course is so naturally pure and plentiful that you don’t need much more than a cup with you. *The Victorinox Rambler is a spectacular knife for ultra-related surgery. It’s tiny, much smaller than the typical Swiss Army knife, and I’ve naughtily carried it onto flights. A small but sharp blade, a pair of toe-chopping scissors, tweezers, and… a bottle opener! Hikers normally take a week to cover this route. It took me just over 19 hours to run it and I was delighted to have not only reached the finish line but come in under 24 hours. This year’s winners, brothers Jonas and Tobias Johansson, came in under 12 hours which is a course record, incredible and also recklessly fast. They have all my respect. I hope I’ve managed to give a decent description of the terrain and practicalities of this race. But there is no way I can adequately describe the pride and sense of achievement I experienced at having completed it. You’ll have to do it yourself to find out.